Yes, this is four years old this track. But that doesn't really matter. I heard it and I liked it. 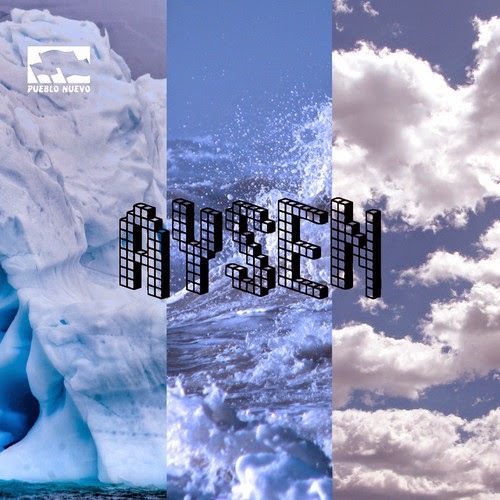 What is the most strange is that the artist behind the track, a Chilean musicmaker called Aysen (perhaps named after the region in Chile, Aysén), hasn't really released much music as of late. In fact, the compilation this track is taken from, 3 estados (referring to 3 states of water; ice, um water, and water vapour), is made up of creations made by Aysen (real name Pablo Flores) in Santiago between 2007 and 2009. In any case this is 'estremecido', which means 'shaken' or 'shivery' in Spanish, and it certainly lives up to its name. Great icicles chime together, heavily knocking into each other and producing waves of frozen air, wafting towards you with promises of cold: chattering teeth and red cheeks. Even the beat is chilly, with cymbals gently shivering with frozen urgency, hi-hats stuttering, the kicks lazily pummelling the air with their gentle sub-bass; the snare itself actually sounds like someone kicking snow, grains of ice chafing together with each hit. A parade of claps, as if the song itself is trying to keep warm, joins this ambient ice music in the middle and at the end, waking you up from this bracing tundra of a track. If you like instrumental experimentally like this, I'd really urge you to check out 3 estados for yourself. All the tracks can be downloaded for free. Whilst Aysen doesn't seem active anymore, the Santiago-based netlabel that released 3 estados, Pueblo Nuevo, is alive and well. Check it out! them. i´m gonna link this web in the social media. Greetings, Pablo.